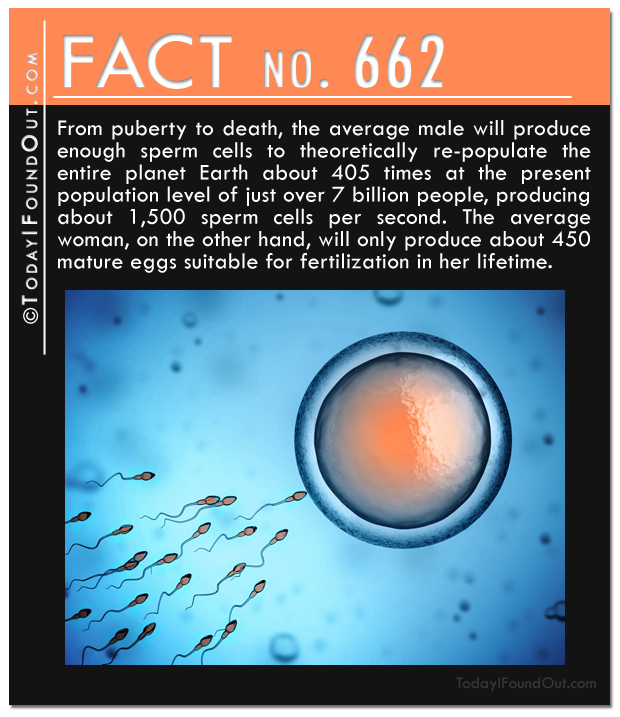 Fact 662: From puberty to death, the average male will produce enough sperm cells to theoretically re-populate the entire planet Earth about 405 times at the present population level of just over 7 billion people, producing about 1,500 sperm cells per second. The average woman, on the other hand, will only produce about 450 mature eggs suitable for fertilization in her lifetime. Fact 663: During the 1988 Seoul Olympics, when the Olympic flame was lit, they accidentally burned alive some of the doves that were released as a part of the ceremony… If you care to see this, there is footage of it on YouTube. 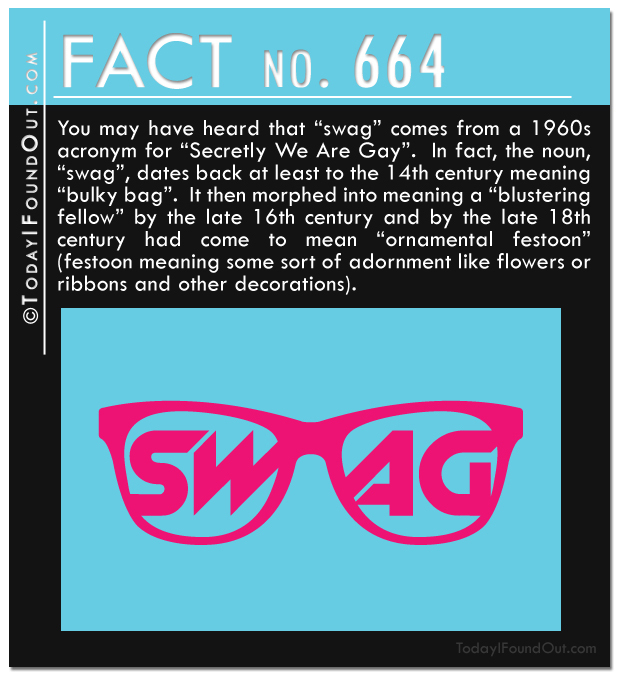 Fact 664: You may have heard that “swag” comes from a 1960s acronym for “Secretly We Are Gay”. In fact, the noun, “swag”, dates back at least to the 14th century meaning “bulky bag”. It then morphed into meaning a “blustering fellow” by the late 16th century and by the late 18th century had come to mean “ornamental festoon” (festoon meaning some sort of adornment like flowers or ribbons and other decorations). 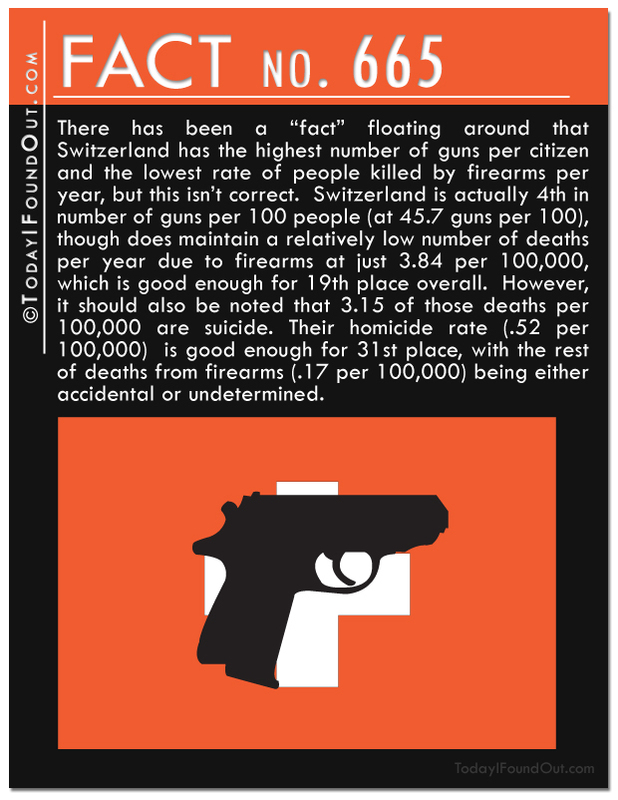 Fact 665: There has been a “fact” floating around that Switzerland has the highest number of guns per citizen and the lowest rate of people killed by firearms per year, but this isn’t correct. Switzerland is actually 4th in number of guns per 100 people (at 45.7 guns per 100), though does maintain a relatively low number of deaths per year due to firearms at just 3.84 per 100,000, which is good enough for 19th place overall. However, it should also be noted that 3.15 of those deaths per 100,000 are suicide. 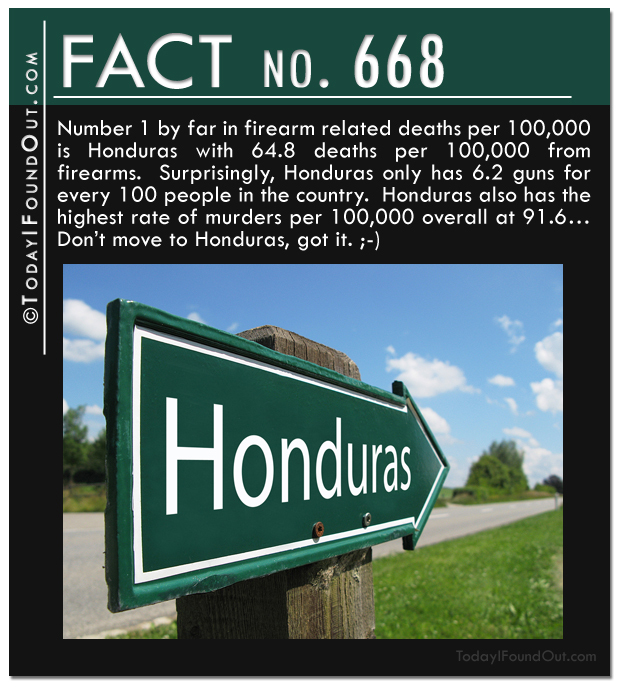 Their homicide rate (.52 per 100,000) is good enough for 31st place, with the rest of deaths from firearms (.17 per 100,000) being either accidental or undetermined. Fact 666: On average, more people commit crimes in Switzerland who aren’t Swiss citizens than who are every year, which has very recently led to harsher deportation laws. In fact, of the top 25 nationalities to commit crimes in Switzerland, 21 of them commit more crimes than the Swiss while on Swiss soil, with the average of all those immigrants being 390% more crimes than are committed by Swiss citizens. 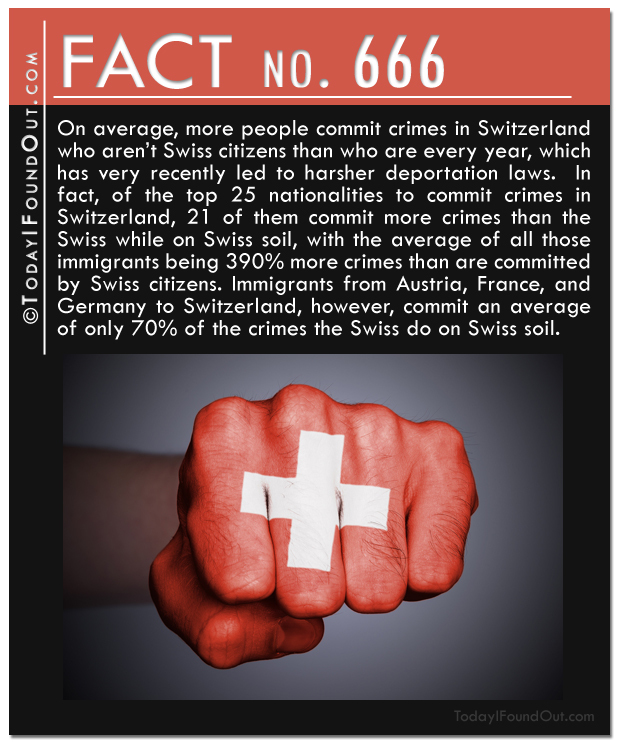 Immigrants from Austria, France, and Germany to Switzerland, however, commit an average of only 70% of the crimes the Swiss do on Swiss soil. 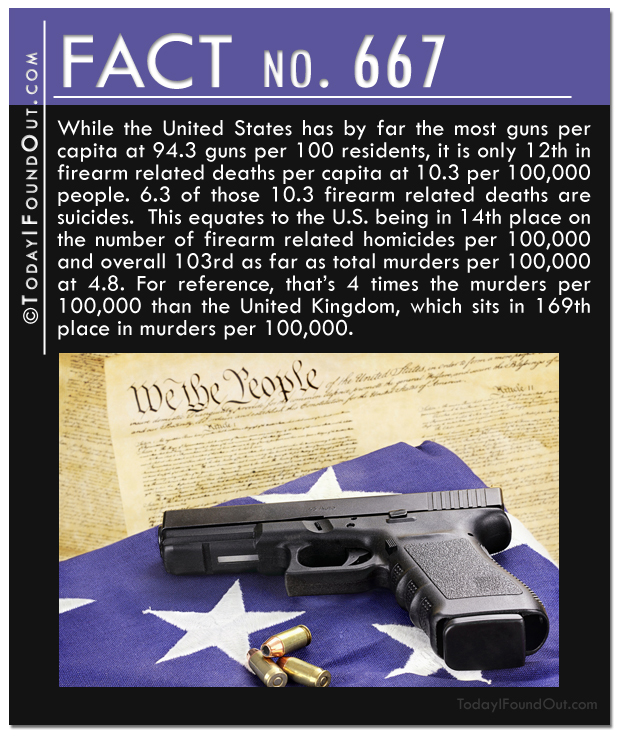 Fact 667: While the United States has by far the most guns per capita at 94.3 guns per 100 residents, it is only 12th in firearm related deaths per capita at 10.3 per 100,000 people. 6.3 of those 10.3 firearm related deaths are suicides. This equates to the U.S. being in 14th place on the number of firearm related homicides per 100,000 and overall 103rd as far as total murders per 100,000 at 4.8. For reference, that’s 4 times the murders per 100,000 than the United Kingdom, which sits in 169th place in murders per 100,000. 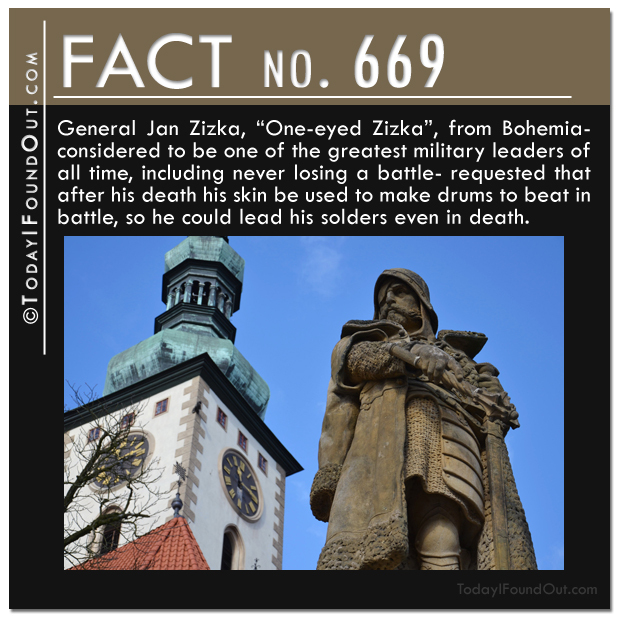 Fact 669: General Jan Zizka, “One-eyed Zizka”, from Bohemia- considered to be one of the greatest military leaders of all time, including never losing a battle- requested that after his death his skin be used to make drums to beat in battle, so he could lead his solders even in death. 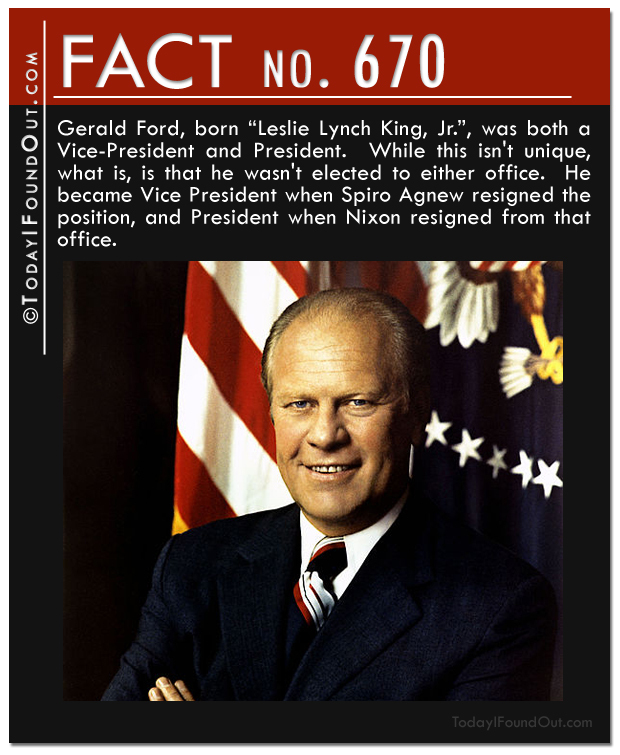 Fact 670: Gerald Ford, born “Leslie Lynch King, Jr.”, was both a Vice-President and President. While this isn’t unique, what is, is that he wasn’t elected to either office. 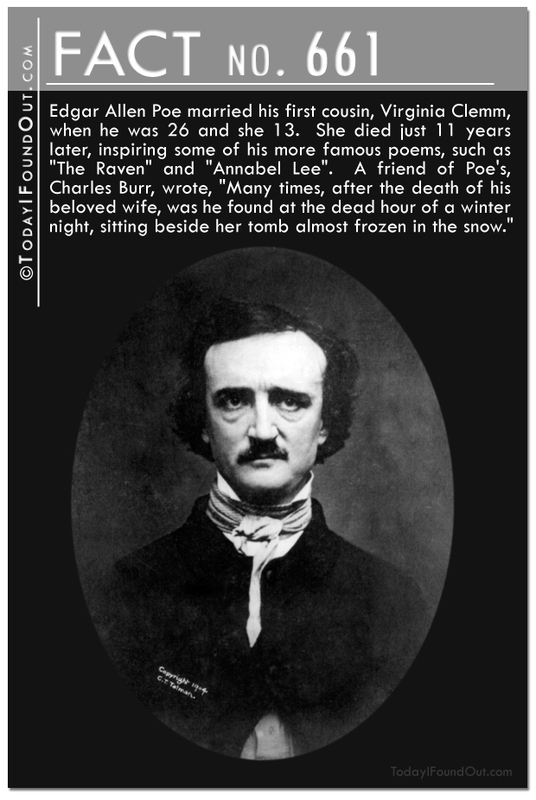 He became Vice President when Spiro Agnew resigned the position, and President when Nixon resigned from that office.